Around the beginning of March after the danger of frost in our area, you can begin to prune back any cold-damaged foliage and/or branches. If there is extensive damage, begin cutting back to green growth. 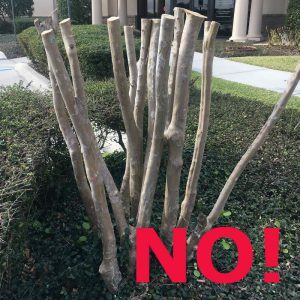 As you prune, this is a good time to check your shrubs for overall shape, removing any crossing branches or suckers, and check for the overall size and shape of your plant. Go through your garden, removing any discolored foliage that is aged and unsightly. Fallen leaves are a good source of organic mulch – and they are free! At this time of year, oak leaves especially are plentiful. If you have large oak trees in your yard, however, remember there can be such a thing as too much mulch. It is not uncommon to have several inches of oak-leaf accumulation below and near large oaks. If this is the case for you, it is best to rake out excess leaves from the bed, leaving your 2-3 inches of depth. You can then use the extra leaves in other beds or use them to create compost (again, a free source of organic fertilizer for your garden). An important principle of Florida-Friendly Landscaping™ is “FERTILIZE APPROPRIATELY”. The improper use of landscape fertilizers has a huge impact on the health of your plants and the health of our natural resources. Consider making this spring a time to learn all you can about the appropriate use of fertilizers. Take a walk through your yard and examine your plants. In general, trees, shrubs, and other garden plants that appear thriving and healthy and with good new growth do not need routine fertilizing. For your turfgrass areas, follow the guidelines for your particular variety, and be careful not to apply more fertilizer than the rate listed on the label. Avoid weed-and-feed products. Soils in our location are usually rich in phosphate. For general use in our area, look for fertilizers labeled with a low, or zero, middle number. In addition, look for fertilizers that are labeled “slow” or “controlled” release. The slow-release benefits of such fertilizers are that you can apply fertilizer with less frequency, and that you will prevent excess nutrients from leaving your landscape and polluting our fresh water sources. There is probably not a more dreaded garden chore than checking automatic irrigation systems, but the benefits more than make up for the labor! By checking your system, you may locate sprinkler heads that are broken or not functioning properly. You may find sprinkler heads that are irrigating your roadway more than your landscape! You may find your controller has been mysteriously “reset” to an undesired schedule (those darn electrical storms!). Remember to reset your controller as the time changes. 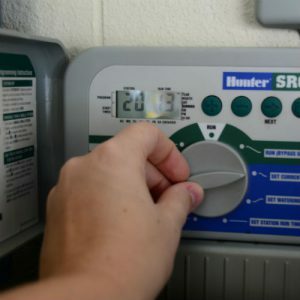 Spring is also a great time to calibrate your system, to make sure you are applying the appropriate amount of water when you irrigate. Often, the error in landscape irrigation tends to be overwatering versus under-watering. It is a source of great satisfaction when our landscapes and gardens appear neat and cared-for. A period of intense springtime effort will result in a healthy and beautiful landscape. 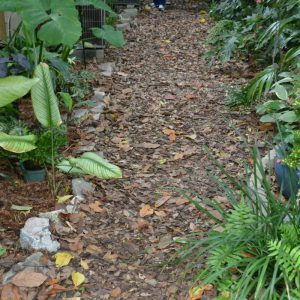 If you have any questions on any of these techniques, or any information on guidelines for the Florida-Friendly Landscape™ approach to gardening and landscaping, the UF/IFAS Extension Polk County Master Gardeners can answer your questions. Call or visit the Plant Clinic in Bartow (863-519-1041). Access online resources for articles, publications, and beautiful photographs showing examples of Florida-Friendly Landscapes™. This blog post was written by Master Gardener Molly Griner under supervision of the Master Gardener Coordinator and Residential Horticulture Agent Anne Yasalonis.